Unique cupcake theme party favors for your birthday party, sweet sixteen, baby shower, bridal shower or wedding. Cupcake theme parties are very popular. 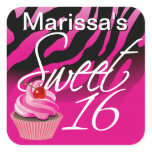 A cupcake party would be perfect for a Birthday Party, Sweet Sixteen, Baby Shower, Bridal Shower or Wedding. 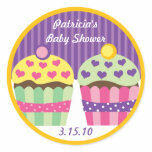 You will find a large assortment of cupcake party favors on this page. Many of these favors can even be customized for your occasion. Some of the cupcake party favors include novelty cupcake toys, lip gloss, candy, premade favor kits, custom favor stickers, personalized candy wrappers, candles, chocolate lollipops, cupcake bites, cookies and more. 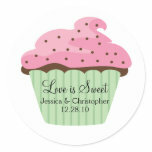 There are so many cute cupcake theme party favors on the market. These cupcake party favors will make a great take home gift for your party guests. Some of the cupcake party favors include cupcake favor bags, bubble necklaces , notepads, mini cupcake rings, lip gloss, plush cupcake, coin purse and zipper pull. Other cupcake party favors include lip gloss, pencils, glitter stickers, straws and marshmallow candy. You can also purchase personalized cupcake party favors such as bookmarks, lollipops, zipper pulls, magnets, buttons and luggage tags. Great favors completely done for you! Premade favor kits contain lots of wonderful theme related items and the best part is that they are complete and ready to hand out to the party guests. These kits are a nice time saver when planning a party and there are three super adorable cupcake party favor kits available. 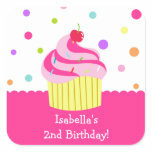 The Lil' Cupcake 2nd Birthday Favor Kit is perfect for your daughter's 2nd birthday. This favor pack includes a Lil' Cupcake blowout, a Lil' Cupcake sticker, 4"H plush cupcake, 8-page activity book and a box of 4 crayons. All of the items come in a matching Lil' Cupcake goody box. The Sweet Treats Favor Box contains a sticker sheet, a blowout, cupcake bubble necklace, cupcake lip gloss, a pastel activity book and (4) pastel crayons. The favors come in a pink and purple polka dot gable box. The Cupcake Birthday Favor Kit comes with cupcake stickers, lip gloss, straw, body glitter, flower jewelry set and a tea party favor box. 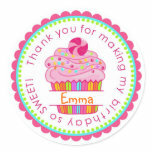 With so many cute cupcake favor ktis on the market, you are certain to find the perfect favors for your celebration. Yummy chocolate treats in a cupcake theme. Everyone loves chocolate! Therefore, chocolate cupcake lollipops would make a super sweet party favor for your occasion. These lollipop favors are simple to make. 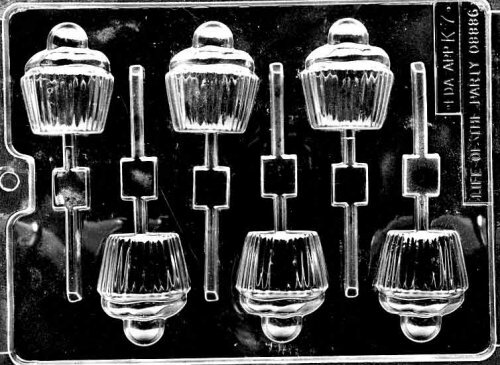 All you need are candy melts and a cupcake candy mold. If you have never molded chocolate before, please visit my Chocolate Lollipops page for step-by-step instructions, videos and supplies. For your chocolate or candy favors. Don't want to make the lollipops yourself? No problem! 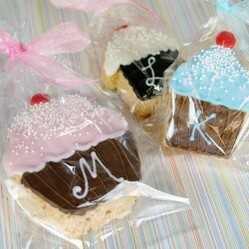 You can also purchase premade cupcake lollipop favors. In addition to the chocolate cupcake lollipops featured above, there are many other delicious cupcake theme treats available. The first are the Cupcake Rice Krispy Treats pictured here. These cupcake-shaped rice treats are are made of puffed rice cereal and marshmallows . You can even personalize these treats with a single initial. You have a choice of icing color and chocolate flavor. Other edible cupcake theme party favors include Brownie Pops, Cupcake Pops and Cupcake Truffles. Another option would be to make your own cupcake bites or cupcake pops. These mini treats are easy to make. Simply wrap the cupcakes in FDA approved bags and tie with coordinating colored ribbon. Please visit my Cupcake Bites page for step-by-step instructions and supplies to make these delicious party favors. Personalized candy cupcakes would make an adorable favor for your celebration. These candy filled cupcakes are available for baby showers and weddings. Each cupcake is filled with vanilla jelly beans which resemble cupcake frosting. You can chose from over 25 different colored labels for your cupcakes and personalize with up 2 lines of custom text. 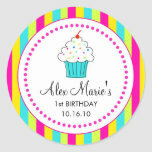 Personalized cupcake mix would be a unique favor for your cupcake theme celebration. These cupcake mix favors are available for birthday parties and baby showers. Each cupcake-shaped mix contains your choice of vanilla or chocolate mix which makes up to 12 cupcakes or 24 mini cupcakes. You can choose from over 25 different colored labels and customize with up to 2 lines of text. It's not a cake, not a cupcake and not a cake pop. Cake push up pops are the latest craze in sweet treats! Cupcake bites are super cute mini cupcakes wrapped in chocolate that you can serve at birthday parties, baby showers, bridal showers and other celebrations.